I love your teacup and neat teapot - can't believe you repaired it so nicely- can't even TELL! Your grands couldn't smile any brighter, I tell ya. TOO CUTE, are they! And, well your sundae made me drool. YUM YUM YUM! What an interesting teapot...I have never seen anything quite like it! And how pretty your teacup is... It is always such a delight to visit with you! Sending hugs your way! I wish I lived closer so Mike could give me an art lesson! LOL Love your sweet teapot and cup, and especially the ice cream with extra fudge. I love that Price Kensington teapot. I think you might know I have one too. It just takes you away to England. I am so glad you were able to repair it and no one would ever know. Great job. What a darling post. our temps here have come down a few degrees which is fine with me. What a lovely setting for your tea. Better have that ice cream quick though! Wow I can't tell that the teapot was repaired. That turned out perfect! 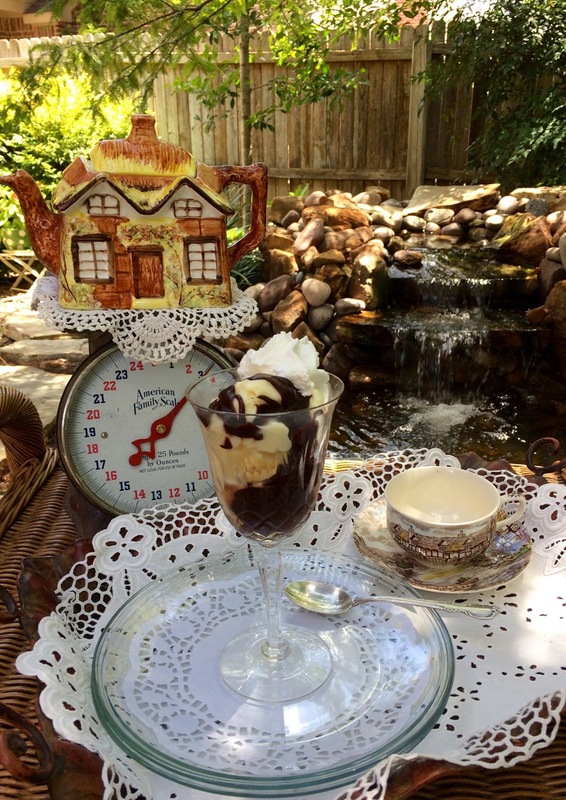 The hot fudge sundae looks so delicious! 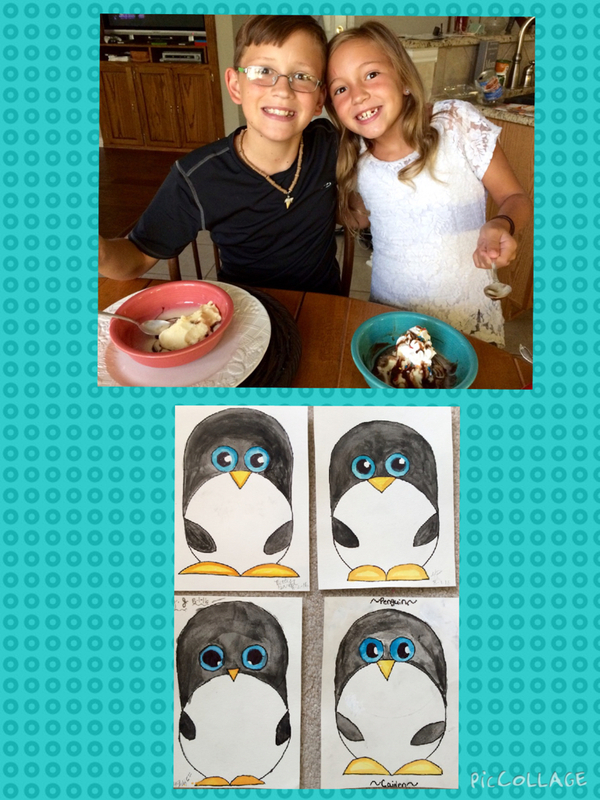 How fun are the penguin pictures you all created! I guess it's obvious you have an artist in the family! How nice to have a clever son! Love the teapot...I love cottageware! And will be having a hot fudge sundae for my birthday this week! I couldn't handle temps that high...we melt in the upper 80s! But your yard looks so cool! Love the cascade. Thanks so much for linking to Tuesday Cuppa Tea! I'm not much for ice cream but your looks delicious, dear Kitty. You would never know that your tea pot was damaged, excellent job. Penguins are my all time favorite!! Those are adorable. The teapot is adorable and disappointing when something arrives chipped - but you can't tell! 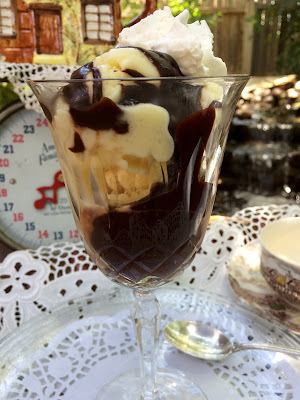 My husband would love this hot fudge sundae, never made my own ice-cream but I'm sure it tastes better than store bought. Any reprieve in sight for your hot weather extreme? That ice cream sure would be good right now. We have had lots of days over 90 this summer! Aw, what cute little penguins! Just drawing them, while having Nana's ice cream, would make you feel nice and cool! Boy, does that ice cream look delicious. Very nice that you and your son could repair the teapot. I love those cottage-y looking teapots and cups. So cozy looking. How darling your grands are Kitty and I adore your crockery. The ice cream looks delicious. Have a wonderful week my friend. I think you are an awesome grandma! Cute artwork :) YUM, ice cream! Hi Kitty, what great fun at your house this week. 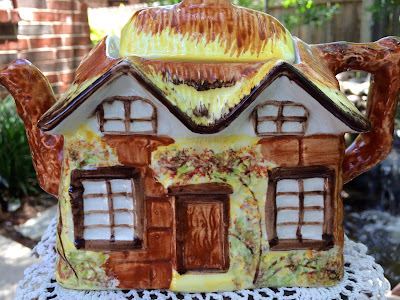 Love the darling cottage tea pot and your son painted the area you filled in perfectly. Oh my the ice cream looks delish and perfect for our hot Texas days. Love the hot fudge surprise. Your grands are adorable and by the smiles had a wonderful time. Love the art lesson too. Such darling works by all 4 of you. Thanks for sharing the ice cream recipe too. Blessings for a great week and stay cool!! Oh does that look yummy! And such cute penguins, too. Very talented kiddies. This post made me smile, Kitty. Your Mike did a fabulous job fixing the teapot. He's a handy guy to have around, I would say. The cottage teacups and teapots are aways a favourite. The ice cream sundae looks lovely. I have never made ice cream but this sure looks easy enough. I remember well my Granny's home made ice cream. It was ambrosia! Thank you for joining me this week and have a super week, my friend. That is the sweetest teapot!!! I clicked on the photo to make it larger, thought I'd be able to see where the chip might have been but could not find it!!! You both did a wonderful job repairing and hiding it!!! I'm impressed! Cute little teacup too!!! That vanilla ice cream looks a little too easy to make, could be dangerous! And I am on a diet. :( When I make sundaes I always put some sauce in the bottom! It's no fun to get to the bottom and have none!!! Love your cooking camp idea!!! Sounds like so much fun! Have a lovely week Kitty! We both shared pretty brown transferwares by Johnson Bros this week! I would never have guessed that your lovely cottage teapot had a major chip. Great job on the repair! Next time I have a hot fudge sundae, I'm going to put hot fudge at the bottom. Thanks for the inspiration, Kitty! Ice cream sundae sounds refreshing in this heat and so pretty in your wedding crystal! My pattern is very similar. No one would know your teapot has a repair. Art lessons look fun. Love and hugs to you, dear Kitty! Ice cream is the preferred treat on hot days. Your sundae looks delicious. I haven't one in years. So glad you were able to repair your teapot. I can't see any trace of where the chip was. 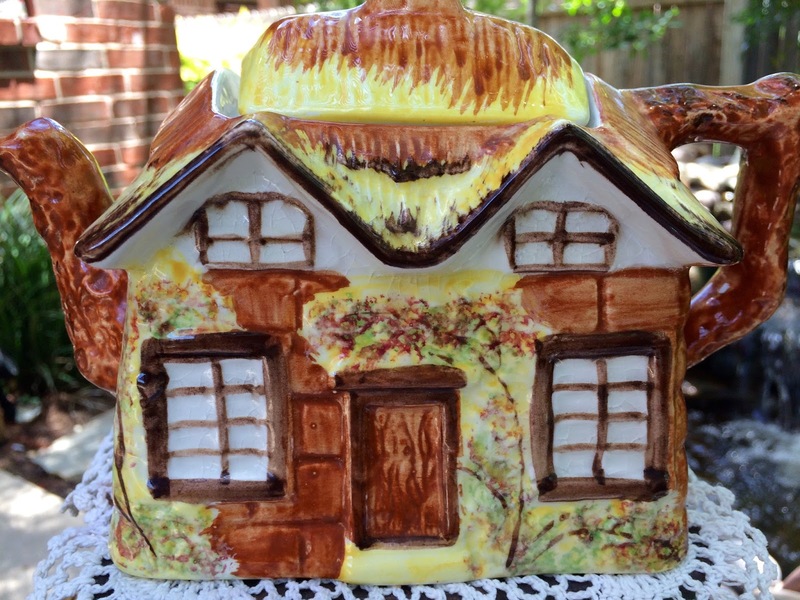 The cottage teapots are adorable and I would love to add one to my teaware collection. Love the penguins! You have some talented artists in your family. Love your restored little teapot...I have several with chips & never thought to try to mend them. Your Mike is so very talented & I love that he is teaching the next generation to draw. Wish I'd had someone like that in my life when I was little. Since we have Handels ice cream right down the road, this is the first recipe of yours that I will NOT be making! LOL It sure looks luscious, though. I'd love to attend Nana's cooking camp! :) I love Johnson Brothers anything. Love the cottage cup. Ice cream ... my Granny used to make vanilla ice cream .. nothing has ever tasted as good. Have a lovely week and stay cool! With this hot weather we're having we need ice cream morning ,noon, and night! Thanks for the yummy recipe! He did a great job on that pretty teapot. I love how you use your goblets for ice cream and it looks so good. Glad you enjoyed the whole thing and the surprise at the bottom. I wanna come to Nana's cooking camp. You are creating such great memories for them. Love it! The ice cream looks so simple and yummy. Glad you are teaching them to cook. It's a life skill. Kitty, ice cream is the perfect dessert (or dinner) for August! Thank you for sharing your recipes. I love love love hot fudge! What a great little recipe. Easy and perfect for your grands to make too. I love hot fudge, so I would love the little surprise on the bottom. The teapot looks lovely. Johnson Bros. has some beautiful pieces. Always a fun time at Nana's cooking camp. Sounds delicious and easy too. The best kind of recipe has that combination. Kitty- You always share the perfect combination of family, delicious food, and beautiful things. I have some ice cream and chocolate sauce here. I think I may need to make myself a treat. Your grands are so cute. Kitty, the ice cream looks yummy! I am not a chocolate lover, but a little hot fudge now and then is delish. Your son is so talented! You would never know there was a chip. Thanks for sharing with SYC. What a lovely post Kitty!! The Vanilla Ice Cream sounds so good!! I can sympathize because we've had 90+ degree days here for a month now!! Looking forward to cooler weather! Kitty, your sundae looks delicious. Of course, anything tastes better in such a beautiful glass as the Franciscan Elyse! How wonderful that your talented son was able to complete the repair on the teapot so beautifully. Hello Kitty, that ice cream sounds wonderful and a great way for the grands to cool off. Having an art class is fun too. Hope you are enjoying summer and staying cool. Enjoy the weekend. You are just having to much fun at your Grand's Cooking Camp this year and so are the Grands! That Ice Cream looks fabulous! Hope you are having a fantastic day and thanks so much for sharing with Full Plate Thursday! What a great recipe and so easy to make and gorgeous tea cups. Thank you for sharing at Dishing it and Digging it Link party. It's always great seeing you. Oooh, wow, when I was quite young, my mom used to make homemade vanilla ice cream. It was sooo good, but took a lot of work. This looks like another delicious recipe I might be capable of making. The hot fudge sundae looks delicious. From your grandchildren's expressions, it must be a winner. 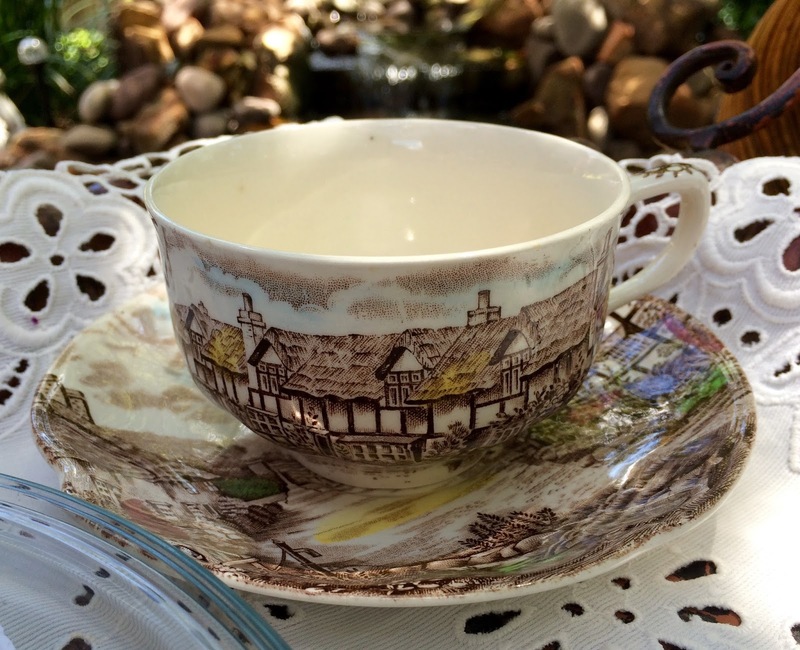 Your cottage teapot and old English tea cup are beautiful!